Combining precision with power, the Zymed Algorithm simplifies even the most complex holter scans – providing you with easy-to-use, fast and accurate beat detection solution in arrhythmia analysis. The Zymed Algorithm uses EASI to derive consistent, highly accurate, full 12-lead ECG information using only five electrodes to detect and document cardiac arrhythmias and ST changes. This means that you can take any beat and display and document as either 3 Channels or as a highly accurate derived 12-lead for saved strips in your Holter Report. • Philips unique QuickScan Mode – an exclusive feature, combining the automation of retrospective scanning and the interactive capabilities of prospective scanning. Atrial Fibrillation Burden is available as a standard Zymed Holter Report Feature. 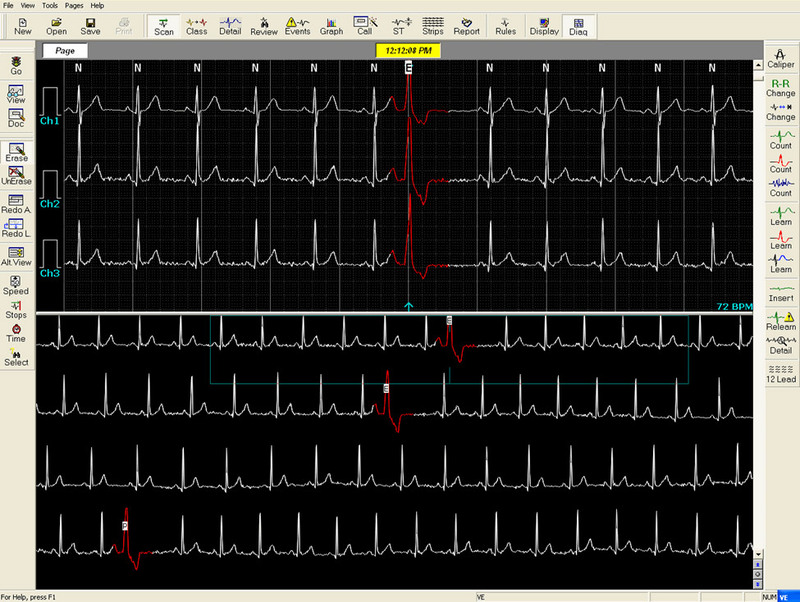 Number of Events, Duration and Total Beats as % helps you determine drug regimen or to check patients post ablation. Click the image below to see a detailed example. Ensure Artifact-Free Analysis – Turn channels on and off dynamically with each beat based on artifact content. Prevent Miscounting Artifacts as Normal or Ventricular – After initial classification, beat information is further processed to screen for artifacts. Categorize on a Beat-by-Beat Basis – Each beat is categorized by matching it against a dynamic, ECG specific library of rhythm and shape templates. Customize and Apply Rules for Beats – If a beat does not match an existing template, the algorithm will extract certain features (rhythm, rate, width, area, etc.) and apply rules to automatically differentiate between normal and ventricular beats based on a weighted features score. For more information about the Philips Holter Monitoring System, click here for the brochure.